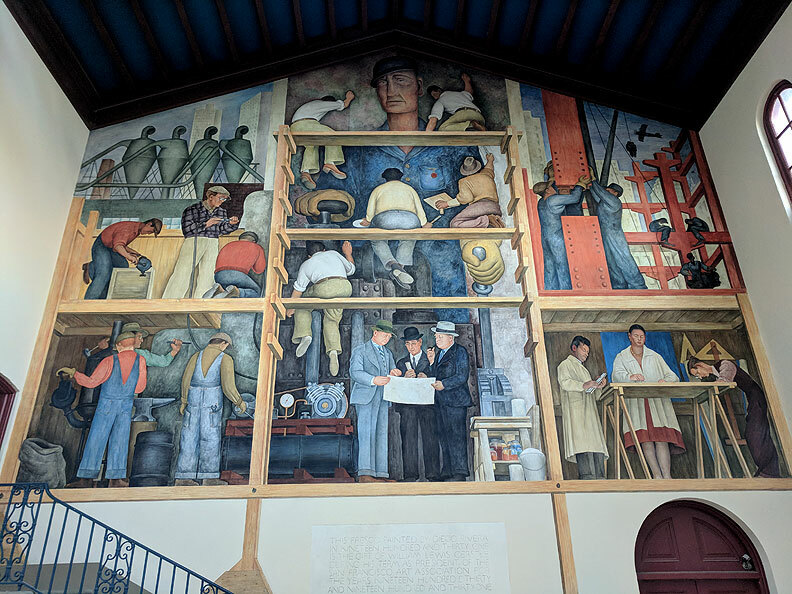 Diego Rivera contemplates The Worker in the center of his 1930's mural at the SF Art Institute. When in September 1930 San Francisco's moderniste architect Timothy Pflueger announced to the world that he was retaining Mexican muralist Diego Rivera to paint a fresco in his newly created Pacific Stock Exchange Tower, he managed to anger just about everyone. Here was an avowed Communist revolutionary about to invade the capitalist citadel. Not only that--he wasn't even a local artist! The seeming paradox--that one of the world's greatest contemporary artists subscribed to Communist ideology--seemed both to attract and repel not only the artistic community but also the public at large. It so fascinated the local press that Rivera was always in the news during the times that he spent in the United States, from his arrival in San Francisco (1930) to paint at the Stock Exchange Lunch Club (today The City Club) and at the California School of Fine Arts (renamed the San Francisco Art Institute) at the beginning of the decade, to Detroit (1932), and then Rockefeller Center (1933), and even later, during his return to San Francisco in 1940 to rescue the Golden Gate International Exposition Art-in-Action program for Timothy Pflueger. 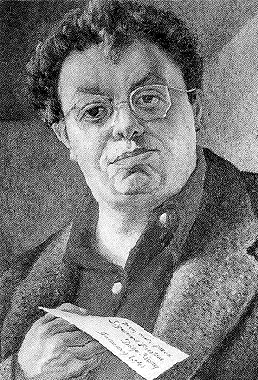 In his recently published study, Diego Rivera as Epic Modernist, David Craven assesses a new paradox: The more Rivera painted about the "immense possibilities latent in America", enabling him to emphasize "the positive potential of contemporary United States society" (i.e., capitalism) (2), the more his colleagues in the Mexican Communist Party "consistently attacked Rivera as a counter-revolutionary because he did not "represent only the negative aspects of capitalism." Thus the strange bedfellows of politics (and ideology) allied Rivera more with US capitalists Ford and Rockefeller than with the ideals of the Mexican Communist Party. A double irony developed when, in order to show his solidarity with and to secure his position within his own Party in Mexico, Rivera painted a portrait of Lenin in the Rockefeller Center fresco in 1933. Unable to accept this portrait in the lobby of an office building with public access but failing to convince Rivera to remove it, its patrons paid the artist in full in order to avoid a lawsuit for breach of contract and then destroyed the fresco. Later that year, Rivera invested his payment in painting a smaller version of the same mural, including Lenin's portrait, in the Palacio de Bellas Artes in Mexico City, "subsidized," so to speak, by Rockefeller money. Interestingly, today's viewers appreciate mainly the artistic merits of these 1930s murals: what might be read as negative commentary on capitalism seems to emerge as admiring appreciation of the power of workers and industry, whatever the economic system and political ideology. Although the New York debacle was still in the future when Rivera arrived in San Francisco to paint in 1930, the local press had begun their sniping. The San Francisco Chronicle published a pastiche of a photo of the grand staircase in the Stock Lunch Exchange Club (today The City Club) on which had been imposed a replica of his fresco panel A Capitalist Dinner (a satiric view of Ford, Morgan, and Rockefeller, Sr., with stock market ticker tape and a lamp-sized Statue of Liberty, in the Ministry of Education Building in Mexico City) to query of the Stock Exchange project: "Will [Lunch Club] art be touched in pink?" The ultimate irony: Today's completed Stock Exchange fresco Allegory of California, albeit hidden from the public in a private club, is one of the real art treasures of San Francisco. Donating $1500 for a small mural on a wall at the California School of Fine Arts (SF Art Institute), Gerstle hoped Rivera would come soon to paint. But Rivera was still under contract for large murals in Mexico City. It would be four years until he actually came to San Francisco, and then he would paint for Timothy Pflueger (under contract for $2500) at the Stock Exchange, thanks to the efforts of Ralph Stackpole, whom Pflueger had commissioned for several sculptures at that site. However, the United States State Department denied this "Mexican Communist" a six-month visa for residing in the United States while painting the project, whereas his own comrades were reviling him as an American imperialist lackey and cohort of millionaire patrons like US Ambassador Dwight Morrow, under whose commission Rivera had painted murals at the Palace of Cortes in Cuernavaca in 1929. Luckily, art patron Albert Bender, an insurance broker who had been buying Rivera easel art, was able to persuade the State Department to reverse their visa restriction. Thus, Diego Rivera came to San Francisco in September 1930 with his charismatic artist wife Frida Kahlo, to be wined, dined, and feted, and to begin work for Timothy Pflueger on the Stock Exchange fresco. Both his energy and the mystique of fresco as a genre so intrigued the local art community that four years later a group of enthusiastic painters had a chance to experience for themselves the magnetism of muralism at Coit Tower. Several from that group went on to other walls; two in particular have left a large public legacy in San Francisco: Bernard Zakheim at the University of California Medical Center and Lucien Labaudt at the Beach Chalet. 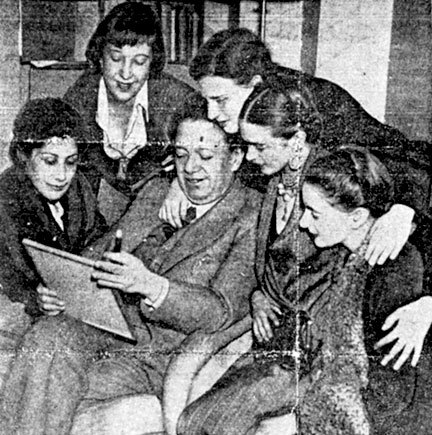 Pele de Lappe (2nd from left) with Diego Rivera, Frida Rivera (Kahlo) and other friends, c. 1930s. The interest in painting fresco murals in California began in the 1920s when UC Berkeley art professor Ray Boynton went to Mexico to study that art genre which Los Tres Grandes (Orozco, Rivera, and Sequeiros) were reviving from older times in Europe. Rivera in particular had studied the fresco of Medieval and Renaissance Italy and had returned to Mexico from his work abroad to begin commissions in that medium in 1921. The fresco technique requires both concentration and spontaneity. Although the artist usually paints ground-up earth color pigments following the outlines of a cartoon previously applied directly to the wet plastered wall, the wall itself has had to have been be properly prepared. The plasterer usually arrives very early on the morning of the day that painting begins (giornate is one day's work) in order to apply a thin layer of plaster over the charcoal design--roughly about a two-foot square area conforming to design elements of the cartoon. The artist, using a small brush (Rivera liked Japanese calligraphy brushes, according to Coit Tower frescoist Edward Terada) applies the earth pigments in small strokes, usually over a black wash base to insure uniformity of color intensity. When the plaster dries, the color particles are suspended on the surface; the completed fresco retains its bright color scheme for its lifetime, for in the proper physical environment, it neither fades nor chips off. If left unmolested, the colors become even more beautiful in time, as the plaster surface develops a "crystal" that intensifies the earth color hues. Thus recently, after restorers have cleaned off the incense smoke and grime of several centuries, Michelangelo's frescoes in the Sistine Chapel in the Vatican seem brighter today than anyone ever expected.